The Singer Link - Network with Singers Around the Globe! This is a one-of-a-kind online choral community for singers and choral conductors to connect. Welcome All Singer Link Members! The Singer Link is a unique community welcoming singers no matter what age, experience level, musical preference, or geographic location. Find more videos like this on The Singer LinkThe Singer Link will offer great opportunities for members not found anywhere else. -Updated musical news and stories -Easy access to the products you need -Singing and conducting tips and information -Concert and tour information -Ability to view and post photos and videos of concerts, people, etc. -Special offers on products and services -Ability to search and connect with people just like you! Please feel free to check out what The Singer Link has to offer and please don't be afraid to tell us what you think! Collaboration between clergy and musicians is vital to the ministry of the Christian church. 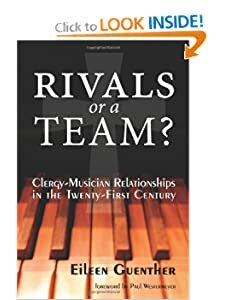 This book explores the importance of teamwork, identifying ways in which musicians and clergy can exercise their separate roles effectively, and suggesting strategies for building supportive relationships. Including heart-felt testimonies from musicians and clergy, Guenther takes a clear-eyedlook at conflict, reasons musicians leave a church, and approaches for transition when the situation just does not work any longer. This distinguished church musician and seminary professor encourages musicians and clergy to work together with mutuality and collegiality in order to fulfill the promise of their ministry. Forward by Paul Westermeyer. Providing new insight into the Wesley family, the fundamental importance of music in the development of Methodism, and the history of art music in Britain, "Music and the Wesleys" examines more than 150 years of a rich music-making tradition in England. John Wesley and his brother Charles, founders of the Methodist movement, considered music to be a vital part of religion, while Charles's sons Charles and Samuel and grandson Samuel Sebastian were among the most important English composers of their time. This book explores the conflicts faced by the Wesleys but also celebrates their triumphs: John's determination to elevate the singing of his flock; the poetry of Charles's hymns and their musical treatment in both Britain and America; the controversial family concerts by which Charles launched his sons on their careers; the prolific output of Charles the younger; Samuel's range and rugged individuality as a composer; the oracular boldness of Sebastian's religious music and its reception around the English-speaking world. Exploring British concert life, sacred music forms, and hymnology, the contributors analyze the political, cultural, and social history of the Wesleys' enormous influence on English culture and religious practices. Contributors are Stephen Banfield, Jonathan Barry, Martin V. Clarke, Sally Drage, Peter S. Forsaith, Peter Holman, Peter Horton, Robin A. Leaver, Alyson McLamore, Geoffrey C. Moore, John Nightingale, Philip Olleson, Nicholas Temperley, J. R. Watson, Anne Bagnall Yardley, and Carlton R. Young. The all female choir performs their cover of Radioheads "Creep" from "The Social Network"
Sign up to chat on The Singer Link.